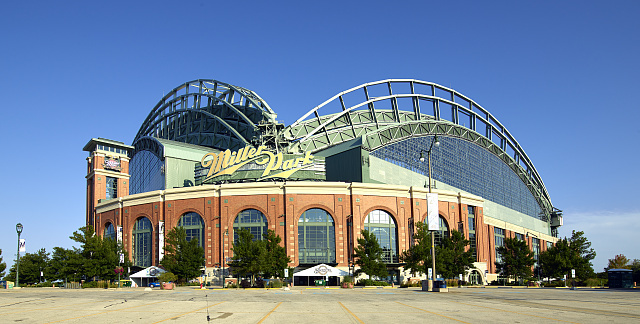 Miller Park serves as the home of the Milwaukee Brewers and bears the name of its primary sponsor, the MillerCoors brewing company. Located west of downtown, Miller Park features North America’s only fan-shaped retractable roof and houses a retro-style asymmetrical playing field designed to benefit hitters and baserunners. Miller Park was the site of the 2002 Major League Baseball All-Star Game, infamous for ending in a tie, and hosted National League Championship Series playoff games in 2011. Statues honoring Henry Aaron, Robin Yount, Bob Uecker, Bud Selig, and industrial workers killed during the stadium’s construction stand near the main entrance. ^ Don Walker, “How Valuable Is the Name ‘Miller Park’?” Milwaukee Journal Sentinel, “The Business of Sports,” July 11, 2011, last accessed July 12, 2016. ^ Miller Park Information, Facts & Ground Rules, MLB.com, last accessed July 12, 2016. ^ Don Walker, “Plenty of Fanfare Planned,” Milwaukee Journal Sentinel, April 6, 2001; “Fit to Be Tied: All-Star Game Called When Teams Run out of Pitchers,” Sports Illustrated, July 9, 2002, http://sportsillustrated.cnn.com/baseball/2002/allstar/news/2002/07/09/allstar_game_ap/, last accessed July 12, 2016. ^ “Bob Uecker’s Statue Dedicated.” ESPN MLB, 31 August 2012, last accessed July 12, 2016. Haudricourt, Tom. 100 Things Brewers Fans Should Know & Do Before They Die. Chicago: Triumph Books, 2013. Pahigian, Josh, and Kevin O’Connell. The Ultimate Baseball Road Trip: A Fan’s Guide to Major League Stadiums, 2nd edition. Guilford, CT: Lyons Press, 2012. Verducci, Tom. “Bleach Boys.” Sports Illustrated, April 2, 2001.